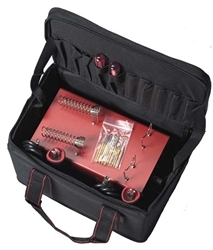 Protect, organize, and transport woodburning units, micro-motor tools, woodcarving tools, and more! The unique exclusive design includes an amazing 20 various sized organizing pouches within the bag. Perfect for organizing not only your burner, but pens, tip, cords, and more. Super tough ballistic nylon, heavy duty zipper, stiff walls and strong handles. 7.25"x8"x11". Woodburner and accessories shown in photo not included. Stick n Burn Owls, Hawks, Eagles Design Pack 2pc Mini/Saw Drill Set Jo Sonja 10 Tube Palette Sampler Gourd Cleaner Ball - 2" Coarse Short Shank 4.5"